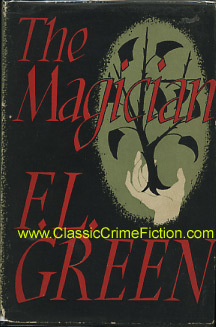 This Frederick Lawrence Green bibliography checklist is only for the mystery fiction books. 1902 to 1953, born in England. DRESSED in a suit of mourning, he daily entered the crumby little restaurant punctually at ten minutes past twelve and again at twenty minutes past five, always in time to take the same place at one of her tables where he sat with an agreeable, patient air, like a man contentedly awaiting his own destiny. Outside, in the cobbled, narrow street behind the commercial heart of the city, carts rattled and the voices of passing people dropped snatches of conversation into the restaurant. The drone and mumble of traffic sounded incessantly from the great avenues and roadways that ran through the city. The weather was very warm, and the restaurant door stood wide open.